Polyurethane Machinery Corp. (PMC) makes a 10' spray foam heated hose for all plural component guns, including PMC, Graco, Gusmer and others. 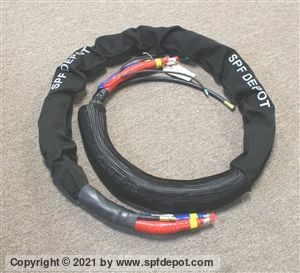 This 1/4 ", 3500 psi heated SPF hose, product # MA-00040A, is made extra tough, featuring a braided copper wire wrapping for heating, surrounded by a protective jacket made from extruded PVC. This heated hose with thermocouple wire is about as good as it gets, and we're offering it at a great discount price. 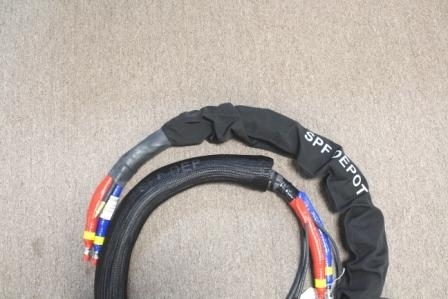 This whip hose heats up your foam or other coating material more quickly and evenly than the others. Ruggedness and reliability are important factors in heated whip hoses since, by the very nature of their work, they experience significant wear and tear. You can, however, expect this PMC hose to serve you for a long time and to produce excellent results while doing so.